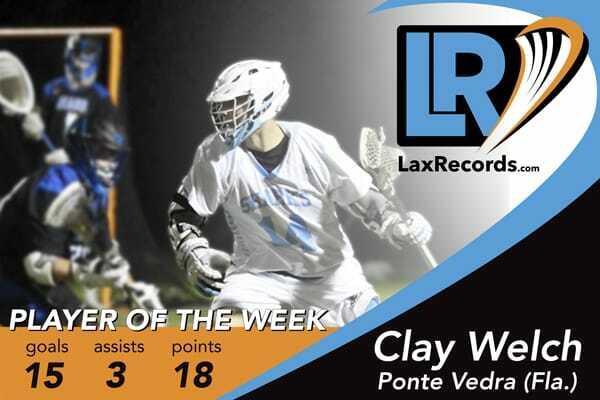 Clay Welch from Ponte Vedra earns LaxRecords’ Player of the Week for March 27. Welch had quite the week, amassing 18 points in four games in five days. 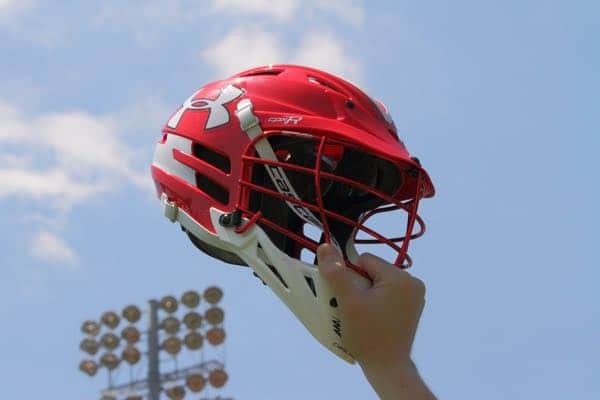 The Mercer commit started the week against last year’s Colorado Final Four team, Mountain Vista (Highlands Ranch, Colo.), by scoring four goals and two assists in an 8-7 win. Welch helped the Sharks overcome a 7-4 deficit. The senior followed that up with a two-goal game the next night against St. Augustine (Fla.). The Sharks won that game 16-5. Ponte Vedra then played the defending South Carolina state champion Wando (S.C.) on March 24 and Welch scored two goals and had one assist. Playing again on Saturday, Welch scored seven goals in the Sharks final game of the week, a 20-8 win over Charlotte Catholic (Charlotte, N.C.). Listen to my full interview with Welch on Thursday’s podcast, which will be available here. Halverson went for 11 points on 10 goals and one assist for Jordan (Durham, N.C.) in a 14-13 win overtime win over Athens Drive (Raleigh, N.C.). Kerig put up an impressive stat line for McDonough on March 22. The Ferrum commit totaled 13 points on nine goals and four assists, won 20 faceoffs and scooped up 19 ground balls. The senior’s performance came in a 20-12 win over Lackey (Indian Head, Md.). Posner scored two goals in the Wednesday game against Haverford School (Pa.), but it was his second that was the difference maker. Posner scored with 24 seconds left in overtime to give the Crusaders an 8-7 win. Sopko scored six points, including the game-winning goal in overtime, as Conestoga defeated Calvert Hall (Baltimore) 13-12 on Friday. Sopko scored four goals and had two assists in the victory. Strough scored five goals and had one assist to help power Cold Spring Harbor to a 10-9 win over Smithtown West (N.Y.) on March 22. Trippi had his hand in four points of the Bulldogs 7-3 win over Gonzaga (Washington, D.C.) on Friday. The UNC commit scored two goals and had two assist in Bullis’ first win over Gonzaga since 2010. Trippi had seven points against Calverton (Md.) on March 21, dishing out four assists and scoring three goals. Traynor netted six points as he helped the Friars to a 13-7 win over Calvert Hall (Md.) on Tuesday. Traynor scored three goals and added three assists to lead the team. He followed that up with a three goal, one assist game against Garnet Valley (Pa.) on Saturday.